"There is gold in our water, wind and sun. Delaying its usage doesn’t store it for future. What we lose today, we just lose it forever. Let us communicate this to all. Every single day of delay is nothing but a loss to all. Let us care more about who will benefit with our efforts than worry about who will own it. Let us not just think what we will gain with an endeavor, but also focus on what we are losing by not going for it. I would like to urge all -- the academia, private sector, public sector, government, donors and other national and international stakeholders -- to have new lens to the opportunities that lie on our table. Our future generation will not blame us for the things that we attempted and failed. They will feel shame for the things that we never attempted despite having a chance." This is to inform all graduate level students from different disciplines (M.A./M.Ed./M.Sc./M.Tech.) 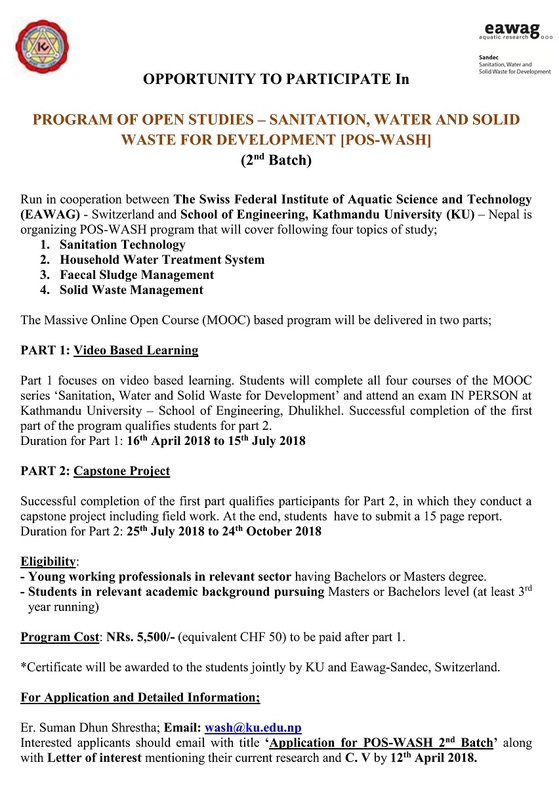 registered in any academic institutions of Nepal that the Aquatic Ecology Centre (AEC) is supporting up to NPR 50,000/- (Fifty thousand) as partial support. This support is made available through financial support of HELVETAS/Nepal following an agreement between the two institutions/organizations, to a maximum of six students. Those interested in considering water issues in their Master's thesis, in particular water governance and water quality may apply no later than 27 April 2018. Kathmandu University, School of Science invites application from qualified candidate for admission to Doctor of Philosophy (PhD) program in the field of Environmental Science at the Department of Environmental Science and Engineering. One seat is available for the research which focuses on trace metal (TE) pollutants and their impacts on aquatic ecosystems. Both local and long-range sources will be dealt in two wetlands (Lake Rara and Lake Ghodaghodi) starting from June 2018. The selected PhD candidate will take part in the project activities of a UGC-Nepal funded collaborative research project. The study will focus on mercury (Hg) and other trace elements in water, sediments and biota (particularly fish) in above mentioned lakes. The trend of Hg levels and potential health risk to humans through fish consumption will also be assessed. The main aim of the study is to describe the environment levels of Hg and TEs (Al, V, Cr, Mn, Fe, Co, Ni, Cu, Zn, As, Cd and Pb) in water bodies and aquatic biota in the Himalayas. For details on admission process and other criteria, please visit www.ku.edu.np/env . Deadline for application submission: April 15, 2018 (Submit a brief concept note, CV and scanned copies of academic certificates). DAI Global, LLC and Kathmandu University (KU) signs an agreement for a USAID supported grant of NPR 10,156,812.00 (US$99,831.05) payable according to the Schedule of Milestones as described in the project document prepared by Aquatic Ecology Centre (AEC) with the grant title "River health and biodiversity profiling in the Karnali and West Rapti watersheds: implications to basin planning and sustainable water resource management in the western Nepal". 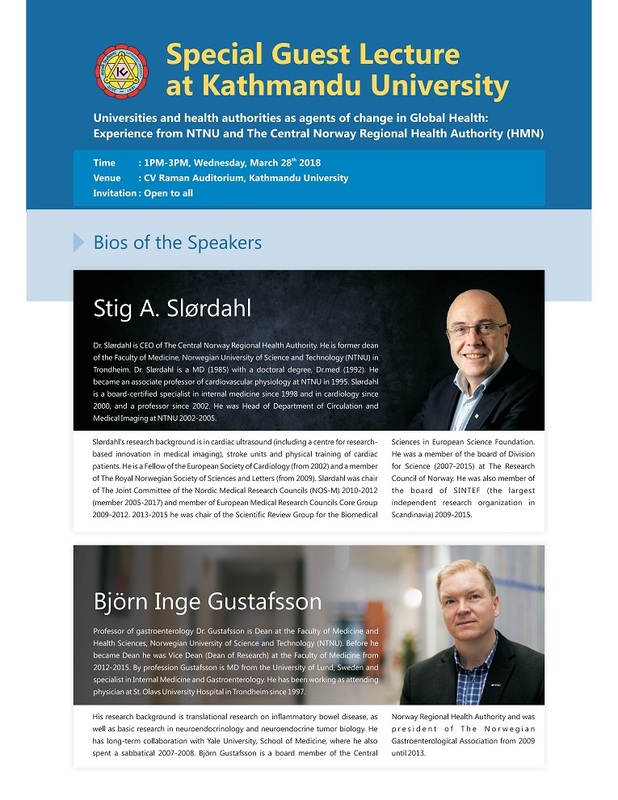 Dr. S. Sharma will led the project as Project Leader and Dr. R.D.T. Shah as Co-PI. AEC will soon announce positions for Researchers and Research Assistants. Any Nepali citizens from recognized institutions with a M.Sc./B.Sc. Biology/Environmental Science degree who are willing to build career in the field of use of biological indicators (invertebrates, macrophytes, and fishes) in assessing the aquatic ecosystem health may express their interests to join. Application may be addressed to the Director, Aquatic Ecology Centre. Application must reach us no later than 27 April 2018. Aquatic Ecology Centre (AEC) successfully completed 14 months longitudinal observational study for building climate resilient Water Sanitation and Hygiene (WASH) in Jiri municipality, Dolakha. Seasonal meteorological parameter, water quality and quantity monitoring along with WASH behavior to reduce health vulnerability was main activity of the study. 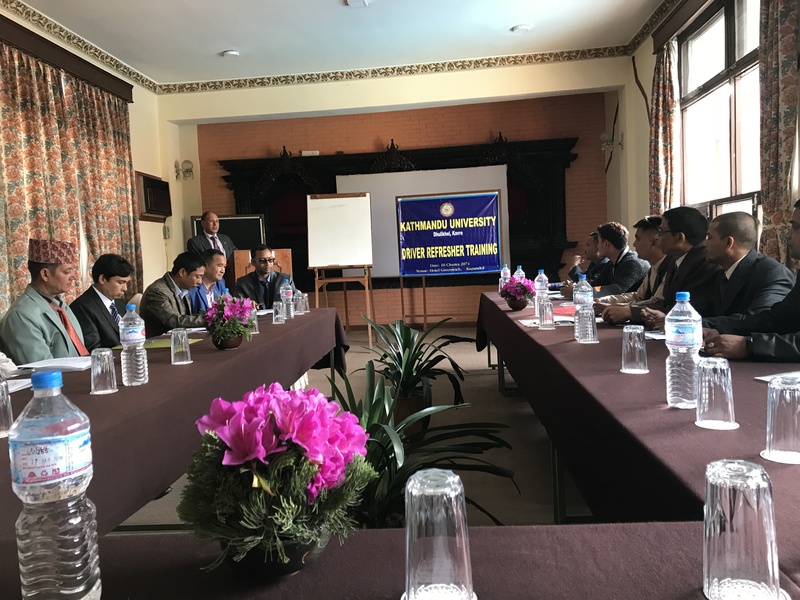 In response to same, a debriefing workshop was organized at Jiri Technical School on 10th March 2018, among municipality and district level stakeholders and government officials. The study evidenced that the seasonal variation in meteorological parameters does influence drinking water dimensions and diarrhoeal diseases. Unimproved water supply system and lack of safety in those improved ones triggered for health vulnerability. Debriefing discussion concluded that Water Safety Plan (WSP) shall be optimum approach to build climate resilient WASH in resource constraint settings. Senior Division Engineer from Department of Water Supply and Sewerage (DWSS) further elaborated the need of WSP by protecting water supply from catchment to consumer. AEC soon plans to organize a national workshop for disseminating same findings and discuss it with national and local level stakeholders and officials for building climate resilient WASH in reducing health vulnerability. Dr. Biraj Singh Thapa, Assistant Professor in Department of Mechanical Engineering, has recently published following Journal Article. A Driver Refresher Training was organized 24 March 2018 involving all the full-time drivers of Kathmandu University. The main subjects of the traning included: duties and responsibilities of a driver, causes of accidents, techniques of overtaking, techniques of cross-country driving, techniques of controlling a vehicle, precautions to be taken during VIP driving, qualties of the driver of VIPs, and the techniques of using GPS in a vehicle. The training was held in Greenwich Hotel, Lalitpur. It was facilitated by Mr. Shiva Pratap Karki, the security Incharge of the University. Dr. Durga Bista, who has applied for the position of Lecturer on Contract for a period of six months in the field of Pharmacy (Pharmaceutical Care) following an announcement made on dated the 18th February 2018 by the Office of the Dean, School of Science, is notified to be successful. Successful candidate is informed to contact the Head of the Department for needful on or before 30th March 2018 during office hours. Successful candidate is notified to visit in person along with Original Documents, as announced. In the event that erroneous information or invalid documents have been provided by the candidate, or do not respond to this notice on or before the given date, the candidate will be rejected and position will be offered to the Alternative Candidate.